Figures for November show that inflation remained steady in terms of the CPI at 2.1%, whilst the more widely recognised RPI measure rose to 4.3% from 4.2% last month. The ONS sited rising food prices offset by falling gas and electricity prices.The movements are inline with the Market Oracle forecast for inflation to drift higher into a January 2008 peak. The interbank money market interest rates continues to drift lower as the central bank auctions inline with expectations are starting to have an effect on the liquidity freeze. 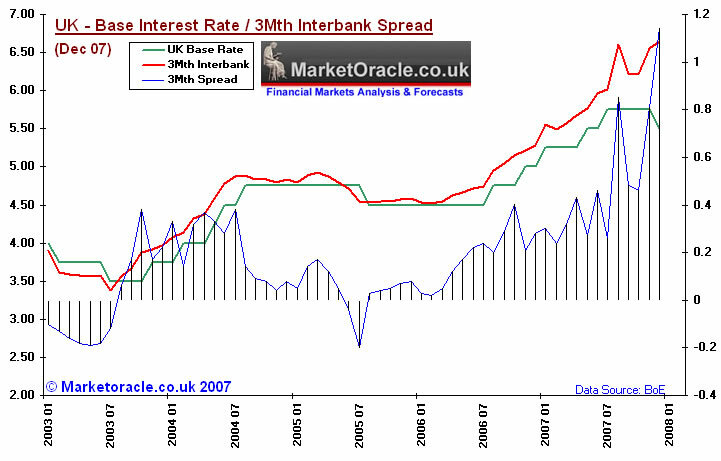 The interbank rate has fallen from a peak of 1.2% above base rates to currently .88% above base rates (3 month LIBOR). However the rates are still substantially higher than the neutral stance expected at the start of a rate cutting cycle. The uptrend in inflation is inline with the market oracle forecast of 26th November 2007 and earlier interest rate forecasts. 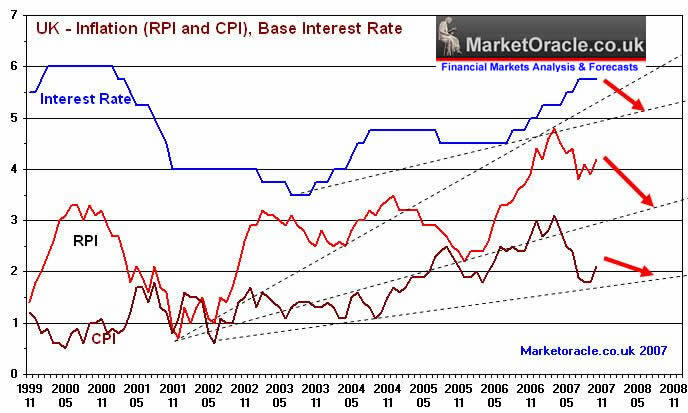 In that inflation is anticipated to peak in January 2008 and then decline sharply as measured by the RPI to below 3% by November 2008, with the CPI targeted to fall to 1.8%. Therefore allowing the Bank of England to continue cutting interest rates towards the 5% target September 2008 as per the analysis of 18th September 07 and 22nd August 07 .